My fashion frenzied sister and I headed down to Somerset House in London to witness the spectacular exhibition, Isabella Blow: Fashion Galore! Now, Fashion isn’t really my cup of tea and fighting through the blustery winds seemed like a lot of effort to see a few garments, but I was pleasantly surprised. The exhibition told the story of Isabella Blow’s fascinating life and how this talented human being excelled, giving us glimpses into her family background all the way to a full video of Alexander McQueen and Philip Treacy’s fashion show tribute to the feathered wonder that is Isabella Blow. 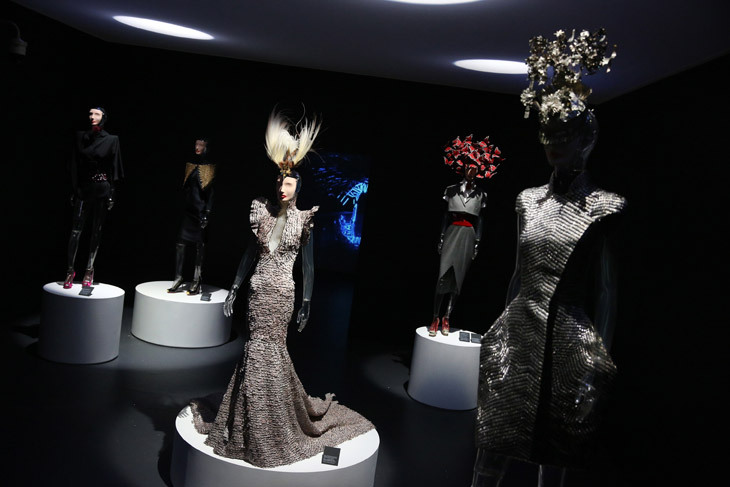 The dark rooms were sprinkled with clothes from several collections including Alexander McQueen’s early work, with pumping catwalk music that drifted through the air from several screens that showed fashion shows from graduates to high end fashion that she was involved in. The air was laced with Isabella’s voice as projections of her interviews took over entire walls. Then, the reason why every well dressed individual present was there, the fashion. 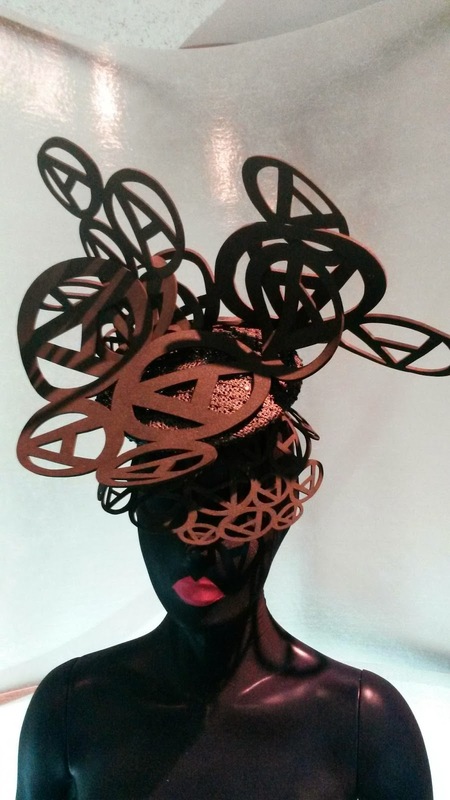 Huge clam-like hats following soft linear curves, feathered dresses, leather tops, mismatching shoes (yes, that’s how she wore them)… The list goes on as these extravagant and bizarre creations stood in front of me as I gawped at the detail and delicacy of each crafted piece. My sister tried to explain upon arrival that, in terms of outrageous outfits, she was like the original Lady Gaga. Strange? Yes, but this woman’s touch made even the oddest accessories look fantastic as if to mesmerise the people around her not steal the attention. See what I mean? Not being a fashion geek myself, this all took me a little by surprise and I definitely had to step back and look at the exhibition as a series of art pieces and stop my practical side jumping in with “why would you wear that? You can’t even see properly!” and other such comments, however, there were a series of extracts from magazines that Isabella Blow worked with that conveyed some beautiful editorial work that took my breath away. This is what really interested me. One of the photographers was David LaChapelle and he is one to keep an eye on! His vibrant, yet slightly surreal fashion photography is fantastic. Each editorial piece caught my eye with a new curiosity. I take my hat off (not the type of hat found in the exhibition. 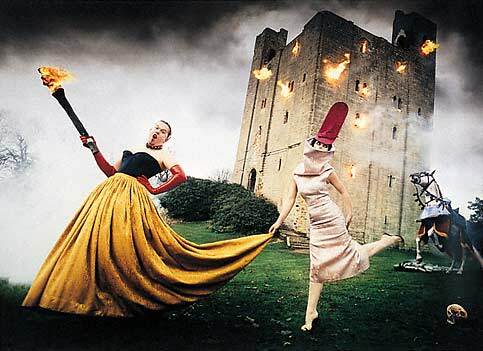 I’m definitely not stylish enough to pull any of them off) to this magnificent talent that is Isabella Blow. Her work is truly fascinating even to a fashion ignorant person like myself. The final rooms in the exhibition paid tribute to her and, I must admit, I sat and watched the final tribute movie at least twice. So, if like me, you are looking for something new or happen to be a fashion geek, head down to Somerset House. I’ll leave you with some of these pieces to nudge you on. Lady Gaga definitely owes a debt of gratitude to Isabella Blow!